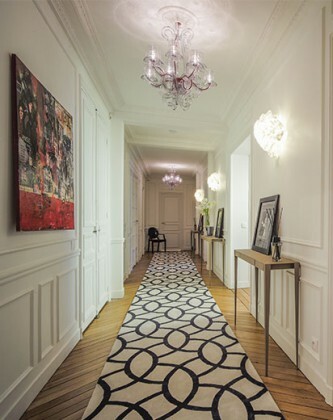 The Relais 12 bis just opened its doors in Paris. A few steps from the Eiffel Tower this new handset, between hotel and guest house, has for goal the welbeing of its inhabitants: to take care of them while leaving them free! In a beautiful Parisian building, the 12 bis has all the characteristics of a Parisian apartment: fireplace, wood floors and original moldings, all pricked with notes of a very modern decor. For the living room and the 5 bedrooms including a family suite, Sabine, the owner has put together a very “cocoon” atmosphere with which is not always the case out of the five stars hotels (!) a wonderful bedding : all beds are 180. in the bathrooms, hospitality products are signed by Anne Semonin. The furniture and decorative objects come from Kartell, Sivera, AM PM … Breakfast is impeccable: Mariage Frères tea, organic jams, pastries basket … Finally be aware that the rooms have painters names: Mondrian, Matisse, Braque … and there is even a speaker who is available for guests to offer them costum-made museum visits … AF-M.